Home > Uninhabited Island > What to do on a desert island? Oh, dear reader project the Free-Freedom !, let you agree on terms. In this article I will tell you what to do on a desert island, if you went there purposefully, for a long time preparing for this, gathering equipment, studied the information and did not get there by accident, having suffered shipwreck, etc. On the second variant - catastrophe I'll write it some other time, okay? I think you yourself will find what to do on the island, but I will just say that I did when I lived on the island Nai, and what to do on the island other residents. The fact is that life island resident is fundamentally different from the life of urban inhabitant. If we are forced in each working day to go to work, then on the island you do not need to go any where you would like to be let nowhere. So all the time island resident - free. He distributes himself day and work (it works and does not work) as much as he neobhodmo. It can never work a day, week, and can be given to work even dark. Also plays a big season, many things are made with respect to the seasons, for example, harvesting, etc. And in general, you know, my friend, just fooling around - this is very boring. This is for you now it seems that, "Here I come to the island, will be there to lie all day under a palm tree!" - Nope, not this, believe me, well, unless you're not incompetent)) Anyway, you'll be looking for something to keep him occupied, will come into the boat in order to catch the fish, jump into the water to get a clam or sea cucumber for sale, you will go into the jungle to collect firewood for the fireplace, or will collect fallen ripe coconuts for copra. Something to build or repair. Messing around in the garden, carrying out more and more new planting, agricultural experiments. Finally, irrigation water landings every day, but several times, to better grow. Observe nature, if you are inclined to do so. Communication with other islanders in their language (but you're on a desert island ?!). Cases can find yourself ... Life itself will respond to you on the question of "what to do". 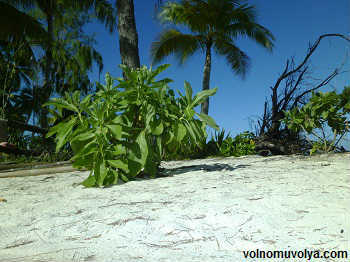 But anyway, like it or not, the main activity on a desert island consists of foraging attempts. By establishing yourself shelter once, you will not come up to this point more, and all your useful energy goes into production of food. The very essence of the desert island sooner or later lost, so it is becoming habitable, such as you, dear reader. And, so people stranded on a desert island it becomes a resident, he becomes an islander, island resident. The native inhabitants of most of the colonizing here are small islands live a pretty austere and traditional. Live as if they were there as a consequence of a shipwreck. Therefore what we want to focus on the life and to be locals. This was a lot of things written on this site, read more carefully! In the tropical heat is not necessarily to build a huge den, cottage on the island. You can do quite a small hut, which build their own locals. If there are no nails (as a desert island), then instead of a house wall as the roof can be covered by conventional mats of palm leaves, but will need more prinarovitsya their produce. 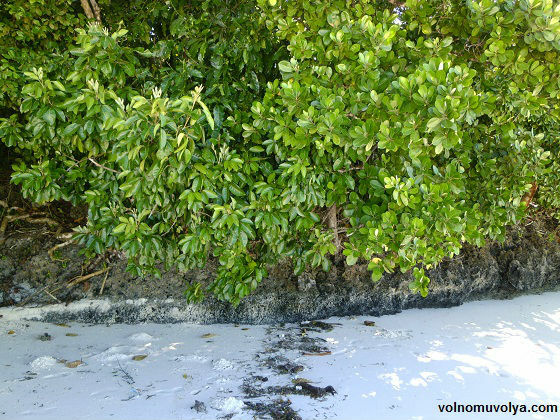 And bear in mind that you need to put your shack on the beach, so do not forget to clear the area of trees and shrubs, it is necessary to provide a free wheeling of wind, while on your beach will be much less mosquitoes, and therefore you will be much less likely to catch malaria or Dengue fever. Keep in mind that if you work in the city in five days, that is, you have two days off, on the island of the same will not happen. Every day is busy you with your work. Every day is the same, the days will go quickly. Sooner or later, when it goes down tropical euphoria, there is a possibility that you all get tired of the monotony of it. However, this does not necessarily have to be, it is likely that this life will not bother you and you vtyaneshsya in it up to his ears. In any case, it's worth it. After all, if you do not try, the rest of his life will be sorry that you had the opportunity, but you do not get it. In general, answering the question: "What do I do on a desert island?" - It can be said briefly: "search for food." Actually I have already said, but I repeat yet, as it is an important question. The answer to this you can find in other articles of this site.